… and some of next week too. THE SEANAD WILL spend almost all of this week debating the Protection of Life during Pregnancy Bill following its passage through the Dáil last week. The bill is scheduled for debate today, tomorrow, Wednesday, and Thursday with Friday set aside for several others pieces of legislation include the new Oireachtas inquiries bill in what is a busy week for senators. Senators will begin debating the second stage of the bill from 3.45pm today with debate resuming at 11.45am tomorrow when the first vote is likely to be held. The bill will then move to committee stage on Wednesday and Thursday with report and final stages of the legislation scheduled to take place on Monday and Tuesday week. There is likely to be significant opposition to the legislation among Fianna Fáil senators with just three out of their 14 members in the upper house confirming they would support the legislation including the parties only two female parliamentary party members. A number of Fine Gael senators are also set to oppose the legislation with Fidelma Healy-Eames confirming her opposition to the bill which legalises abortion in circumstances where there is a risk to the life of a woman, including risk of suicide. Other Fine Gael senators including Lucinda Creighton’s husband, Paul Bradford, are also thought to be doubtful about supporting the bill. A number of Labour Party senators, particularly ones based in rural parts of the country, have also expressed reservations about the legislation but the coalition partner’s leader in the Seanad, Ivana Bacik, said last week she expects the bill to pass into law. She said she was looking forward “to a respectful and reflective debate on its provisions over the coming week, before it is finally passed into law – 21 years after the X case”. Email “The Seanad will spend most of this week debating the abortion legislation”. 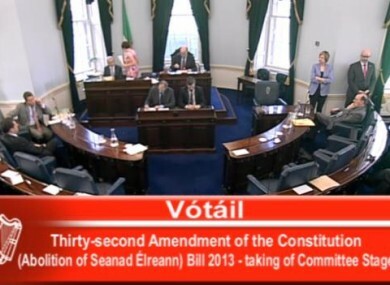 Feedback on “The Seanad will spend most of this week debating the abortion legislation”.